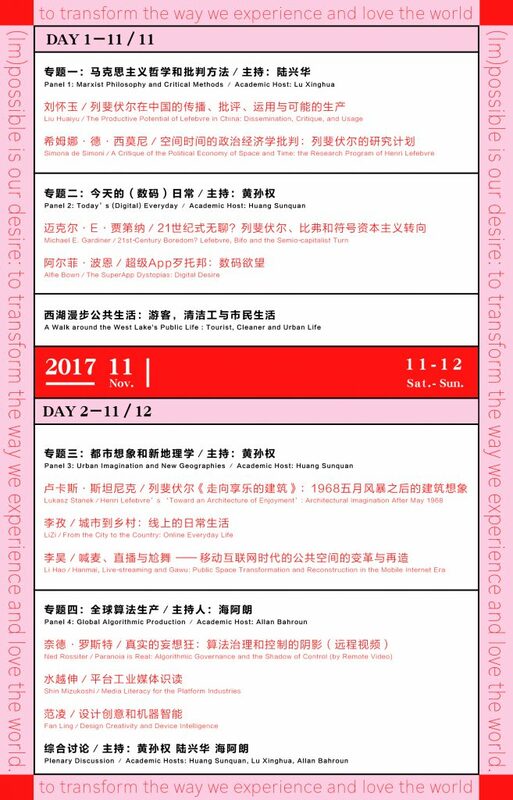 On the 11th and 12th of November 2017, the Institute of Network Society, from the School of Inter-Media Art at the China Academy of Art, will host its Second Annual Conference **“Another Walk with Lefebvre: Critique of Urbanism and Everyday Life in the Algorithmic Age”**. Our collective celebration will bring together researchers from the U.K., Canada, Italy, France, Australia, Japan as well as China, Hong Kong and Taiwan. This year, we draw our critical impetus from one key thinker of modernity: Henri Lefebvre. Our aim is to rediscover his work through today’s urban and algorithmic mutations. Inspired by Lefebvre, our four panels will engage in the creative act of depicting and re-inventing urban space and everyday life: Marxist Philosophy and Critical Methods, Today’s (Digital) Everyday, Urban Imagination and New Geographies, Global Algorithmic Production. Like Lefebvre, our conference forms the (im)possible wish to invite everyone to transform their ways of experiencing and loving the world. Departing from Lefebvre’s life and theory, we explore his ways of practicing philosophy through his political engagement in the XXth century. His personal experience and his theoretical work have been the two sides of one inspiring adventure. Situating Lefebvre among the many generations of cultural and social theorists, the discussion will highlight his creative interpretation of Marx’s critical project. Parallels between the post-war European context and the post-reform China will be drawn to pinpoint the contemporary relevance of his ideas. Following Lefebvre’s invitation to describe the minutiae of everyday life, this panel delves into our quotidian experience and its omnipresent digital mediations. Speakers will attempt to grasp new tensions arising between work and leisure through the redistribution of desire, boredom and enjoyment. Production and consumption implied, for Lefebvre, the unfolding of social temporality and subjectivity. Social media and mobile apps in China, as well as abroad, will serve as a focal point of inquiry. Confronting the theoretical and empirical foundations of Lefebvre’s work, this panel takes us into urban development and architecture. We will reevaluate Lefebvre’s ideas on urbanism through a new critical analysis of our increasingly computerized-capitalized geographies. Lefebvre’s sensitivity to kinetics between the body and landscape in our daily spatial practices will emerge to call for a radical politics. It goes without saying that ambitious political imagination is needed to meet the challenges raised by technological policies such as that of the ‘Smart Cities’. This final panel will change scales, moving up from the quotidian and urban experience, to map out the shifts in territorial powers. The new divisions of labor, the integration of softwares, the mutation of infrastructures all express the need to update Lefebvre’s heritage of urban studies into the active investigations on globalization and the Internet of Things. In a time of networked cultures and transnational organizations, speakers will address the ways in which algorithmic modes of production challenge our conceptions of State, Power and Emancipation.